January 6th, 2015 (10:26 PM). Edited January 27th, 2015 by MtArgente. 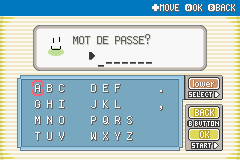 Hey, I'm MtArgenté, a French Pokémon hacker. My team and I have worked a lot on this hack that I'm proud to present to you today. Q: Why are the tiles so ugly? 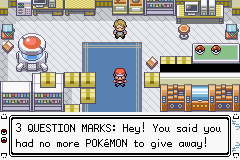 A: We have seen many hacks implement newer gen tiles into 3rd gen, and to us it is silly. So, we implemented 2nd gen tiles into into 3rd gen.
Q: What is the gameplay like ? 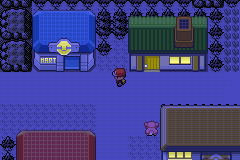 A: You travel from the overworld to different towns and routes. A: This hack uses JPAN's level adjustment hack... thing. Wild Pokémon and trainers are balanced in this way. 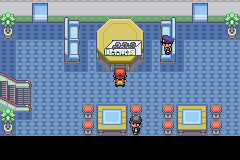 When playtesting, myself I beat the game with the two Pokémon, Cubone and Weepingbell, you can get at the beginning. 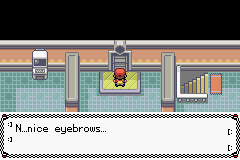 Also, many Pokémon had their evolutions changed so they evolve much sooner. It is pretty easy... sorry if you wanted a challenge ! Q: Why is it always night time? A: It's fun and relaxing sometimes to play games at night. Since most people mute the game anyway, I recommend you play this with Take Five and other nice songs. This is just a hack you play to have fun. Maybe you will like some of the dialogue but there is no dedicated storyline. We're really solving it ! Oh no ! Who could this bad guy possibly be ? But this is the destiny of those who want to fight the state...!!! A password ? What could it be now ? 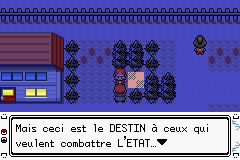 VS Gym Leader MUSTY. Do you have the skills? Probably. 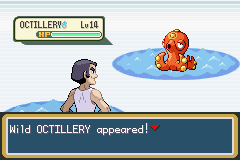 Just a battle with an octopus. I like this route very much. One other thing I'd like to say is that we added some new moves that you can use. They are pretty broken in your favor :P (not instant wins however). 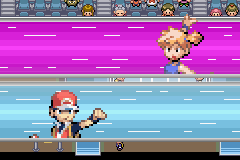 Custom trainer battle music. 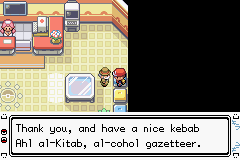 In places with Johto tiles, you hear Johto trainer/gym themes, and likewise for Kanto. 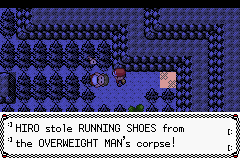 There is no Johto wild battle midi that we found however, so you get... something else. Sprite glitch after ending battles on some maps... really wish this didn't happen or at least say we did it on purpose, but no. I have no idea what causes this. Note : There is a list of every known, intended mistake ! If you want (maybe you are very bored) you can compile your own and see if you got them all or found something new ! If you are an avid hacker, can you explain also what would normally cause the glitch ? This is the true test of skill, dude ! A lot of outside help was used, tutorials and all, but I kept bad notes on this... if you think your work was used and want to be added, I will add you, I want it to be clear. Music is really great to listen to while working! January 7th, 2015 (5:52 AM). Does this have any new moves/abilities or the PSS split? January 18th, 2015 (6:10 PM). January 19th, 2015 (8:55 AM). Interesting choice of tiles. 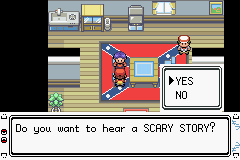 Did you change the story or is it the same as in the original Firered? January 19th, 2015 (10:05 AM). I know you mention it in the first post. 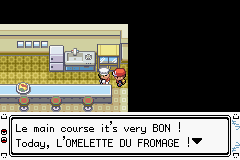 But, the way you've claimed to "implemented" Gen III tiles into Gen II, or the other way round, is very sloppy. 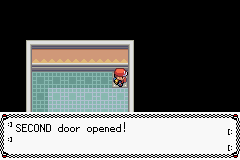 You've literally just pasted gen II tiles on the default tileset. 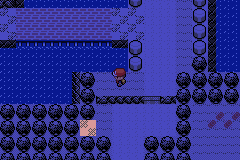 If you're going to mix styles, at least try to make them blend, like, devamp all the Gen III tiles. 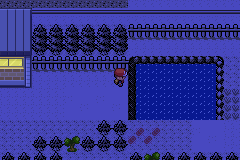 As, Pokemon Christmas shows, Gen III tiles work really well in the Gen II environment, if you implement them correctly. 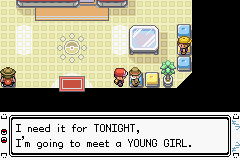 Also, without some "serious" storyline, I feel this hack might not get much, or a lot of attention. S P O O P - A - T R O O P ! ! ! January 20th, 2015 (7:30 PM). 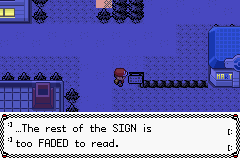 It is completely different than FireRed. January 20th, 2015 (8:37 PM). January 20th, 2015 (9:35 PM). January 21st, 2015 (7:07 AM). To me, that's like saying; "We can't be bothered to sort out and decide on a proper style." January 27th, 2015 (5:20 PM). Hello to all. I don't like to bump my own thread like this, but I was thinking that I should add some more pictures. These are not new updates but just showing more of the game! They are also in the OP now. January 27th, 2015 (11:05 PM). 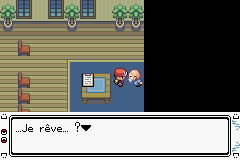 Will you be changing the overworld sprite for the protagonist? 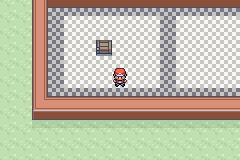 It just urks me for some reason that you have a muscle builder as your battle sprite but you have Red in the overworld.